We have resumed the development in the field of searchlight technology. 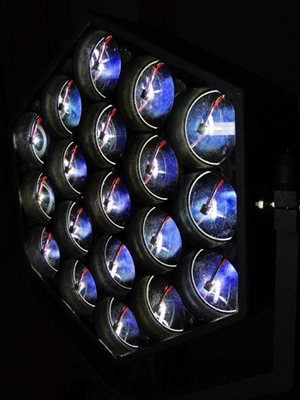 Being the most modern way of generating light, LED-Technique is applied in BeckLite searchlights. To demonstrate the power of the new BeckLite LED searchlight, our town church is illuminated from 600 m distance. The total power consumption is 70 W.
Here you´ll see "The City Church of Meiningen, illuminated by the Becksearchlight on New Year´s Eve 1937" on the web documentary on Heinrich Beck und the Becksearchlight, the strongest searchlight worldwide with a power of more than 20 kilowatts between 1912 and 1945.